Peng, S., Zhao, C., Chen, Y. and Xu, Z. 2017. Simulating the productivity of a subalpine forest at high elevations under representative concentration pathway scenarios in the Qilian Mountains of northwest China. Scandinavian Journal of Forest Research 32: 166-173. Citing the work of Friend et al. (2014), Peng et al. (2017) write that forest net primary production (NPP) is "highly sensitive to climate change and CO2 concentration increase." Yet, they lament the fact that "how subalpine forest NPP at high elevations would respond to global change (e.g. climate and CO2 concentration changes under [predicted] representative concentration pathway (RCP) scenarios) at the ecosystem scale remains unclear." In attempting to remedy this knowledge-gap, the four Chinese scientists used survey and measurement data of Picea crassifolia forests in the Tianlaochi catchment (Qilian Mountains, northwest China), along with the Biome-BioGeochemical Cycle model of Thornton et al. (2002), to "assess the effects of future climatic changes and atmospheric CO2 concentration increases on the NPP." The results of the study revealed, in the words of the authors, that "greater increases in temperature, precipitation, and CO2 concentration caused larger increments in [predicted future] forest NPP." The most effective parameter responsible for increasing forest NPP was rising atmospheric CO2, followed by temperature and precipitation. 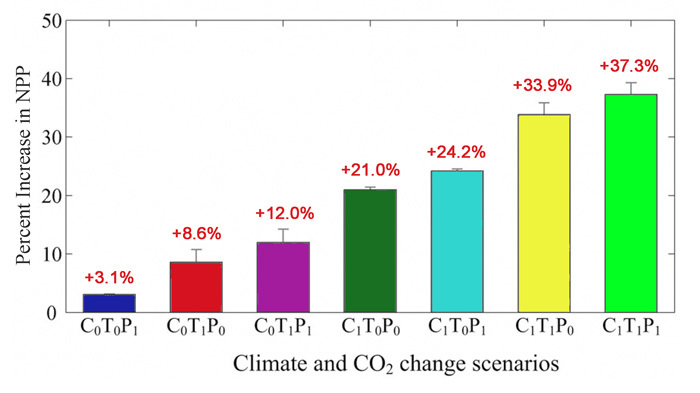 As shown in the figure below, precipitation and temperature changes alone resulted in predicted future NPP increases of 3.1 and 8.6 percent in 2050 compared to the present, whereas elevated CO2 alone caused a 21 percent rise. What is more, the impacts of these three parameters on NPP was additive, such that in the combined elevated CO2, higher temperature and high precipitation scenario, NPP of the P. crassifolia forests in northwest China is predicted to rise by over 37 percent by 2050 (relative to the baseline 1960-2000 year period). In light of the many above findings, forest managers should be excited about what the future holds for this region of northwest China, courtesy of rising atmospheric CO2 concentrations and forecasted accompanying changes in climate. Figure 1. Mean change in Picea crassifolia forest net primary production (NPP) under the different climate and atmospheric CO2 scenarios (C0 = 340 ppm CO2, C1 = 487 ppm CO2, T0 = ambient temperature, T1 = ambient +2.18°C, P0 = normal precipitation, P1 = normal +3.1% increase in precipitation). The percent changes represent differences in 2050 from a 1960-2000 baseline. Figure adapted from Peng et al. (2017). Friend, A.D., Lucht, W., Rademacher, T.T., Keribin, R., Betts, R., Cadule, P., Ciais, P., Clark, D.B., Dankers, R. and Falloon, P.D. 2014. Carbon residence time dominates uncertainty in terrestrial vegetation responses to future climate and atmospheric CO2. Proceedings of the National Academy of Science, USA 111: 3280-3285. Thornton, P., Law, B., Gholz, H.L., Clark, K.L., Falge, E., Ellsworth, D., Goldstein, A., Monson, R., Hollinger, D. and Falk, M. 2002. Modeling and measuring the effects of disturbance history and climate on carbon and water budgets in evergreen needleleaf forests. Agricultural and Forest Meteorology 113: 185-222.